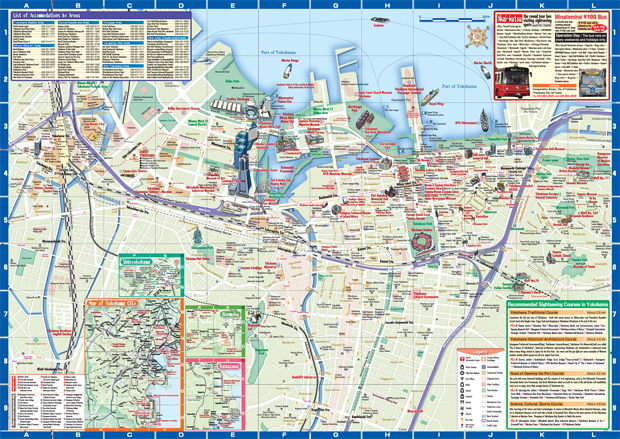 Yokohama, is the first harbor city introduced to the world as the entrance to Japan. Since the time its port was opened, Yokohama has been vigorously acquiring new cultures and information from foreign countries and introducing to Japan our country's first-time-ever things from food to a wide range of cultures, which entitles Yokohama as the birthplace of Japan’s modern culture. The Yokohama, referred to as “Hamakko” in Japanese, has been very cheerful at enjoying life and willing to adopt whatever is good. Such a tradition of the “Hamakkos” cultivated long ago has been incorporated into the present fashionable and sophisticated streetscape. According to documents, Yokohama dates back to the 11th century. The Kanmu Heishi family is said to be from Yokohama. Yokohama was ruled by the descendants of Yoshibumi Taira, and this rule continued up to the 16th century. In the 12th century, the Kamakura period, Yokohama was developing, and Shomyoji Temple and Kanazawa Bunko were built in Kanazawa by Hojo. At the same time, in Kozukue, rice cultivation had been established by Yasutsuna Sasaki. After this, during the Edo period, most of Yokohama came under the direct control of the feudal government except for the Mutsuura Clan in Kanazawa which came under the control of a feudal lord. In 1601Kanagawa and Hodogaya, and in 1604 Totsuka became post stations on the Tokaido Route. In the early 19th century as the population increased Kanagawa became as important as a town as Odawara (a castle town).